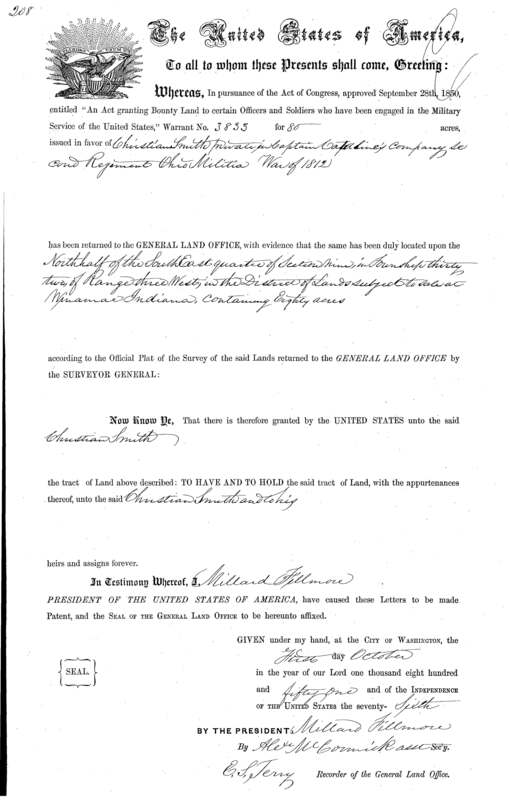 As reward for his service in the War of 1812, my gggg-grandfather Christian Smith was granted land by the U.S. government. Christian Smith was drafted into Captain Jacob Catterlin’s 2nd Regiment Ohio militia in Fairfield County, Ohio. He served from September 1, 1813, until March 1, 1814. Military Warrant No. 3833 for 80 acres issued in his favor: the North half of SE qtr of Sec 9 in Twp 32, Rng 3 W in the Dist of Lands subject to sale at Winamac Indiana. This record was found at the U.S. Department of the Interior, Bureau of Land Management, General Land Office Records. Issued date: October 1, 1851. This was the land mentioned in the biographies of Walter Lightcap and George Lightcap. Their father Levi was moving the family to Iowa when they stopped in Indiana to visit his wife’s parents, Christian and Rebecca (Firestone) Smith. Christian offered Levi land, and he accepted. The family settled in Starke county, near North Judson.